It happened 10 years ago. But the incident is still fresh in my mind. I was working as a Business Analyst at IBS Software services. I used to travel to South Asian countries because my work demanded me to travel for requirement gathering and product demos. As our clients were "airlines" around the globe, I had one of the best globe trotting experience during my IBS days. I spent the summer of 2007 in Guangzhou, China. This place is quite close to HongKong. After a hectic week of client meetings where my boss Gunjan, our sales director Joben and I slogged to demonstrate our product to our client, we finally had some breathing time one night before returning to India. As we did not have time to even shop much in China, we decided to cut loose and paint the city in all colors before taking the flight back to India early next morning. 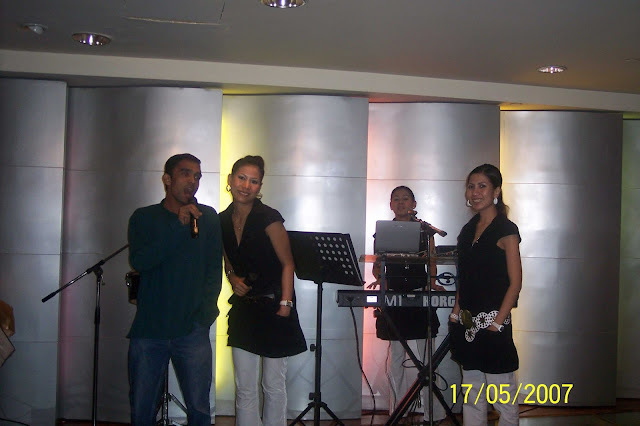 So around 8 PM that night, we took a local cab and asked the cabbie to take us to a place where they play good music. He did not understand a word. Back then, English was not enough to survive in China. We tried to explain to him in sign language too; but he did not seem to get it. Finally Joben said "Is there a Karaoke place around?" The cab driver understood the word "karaoke" and took us to a club. Once we arrived there, we walked in with some Chinese-trance music inviting us. It is a genre that I have not heard after that in my life. That music made me dizzy and we decided to leave the place. After roaming around the city, we finally came back to our hotel at midnight. As we had only few hours to catch our flight early in the morning, we decided to go to the Marriott lounge bar and to our pleasant surprise a Filipino band was playing English songs there. There were not many people in the lounge at that time. Seeing us, the Filipino girls got excited because they finally had three people who were able to understand what they were singing. One of those girls initiated a conversation with us and when she found that we loved western music, she invited me to join them on stage. I ended up singing a Cliff Richard song (Bachelor Boy) and an Elvis Presley song (Judy). I came back to our table and suddenly they announced " To the three gentlemen from India, we would like to dedicate an Indian song" and dedicated "Made in India" by Alisha Chinai for us. How often does an incident like this take place? As in, a Filipino band singing a Hindi song for Indians in China? Of the many things that took place in my Guangzhou visit, this incident is still etched in my memory. With this photographs and some smart FB alogorithm, you can find one of the singers and record a song in smule now :). Wishful thinking. And I am waiting for you to sing perhaps.. perhaps..perhaps. That is a possibility. "Perhaps^3" is a beautiful song. I shall definitely try that.